A spirited penchant for capturing frozen moments of movement in dance and for re-enacting the tendencies of the natural landscape have shaped Singapore-based Shyama Nadimpalli’s thematic preoccupation on canvas. It is intriguing to witness the magnificent synthesis of these two favourite themes in her oil-on-canvas titled Changing Clouds. There is indeed a visual aspect referred to as ‘impressionistic clouds’, hailing from an art-historical perspective. These are clouds that are rendered on canvas in the style of the genre of impressionism, a phenomenal art movement of the 19th century that originated in France (which marked the inevitable emergence of modern art in the western context). The Impressionists exuded a staunch fascination towards arresting the mood of natural light in various times of the day, using thick, quick and short strokes of paint that reflect the feel of immediacy. In Changing Clouds, the viewer is mercilessly lured into the glamour and vivacity of the dancing clouds, instantly bringing about the feel of impressionism, not within the genre’s typicality, but in Shyama’s victorious effort in characterising the mutated sense of sunlight amidst the clouds. It may be dawn. It may be dusk. Nevertheless, what remains constant and clear is the notion of destined transition, of light and of life. The luscious greenery portrayed in the painting is rendered in the sketchy, suggestive brush-strokes of the genre, as an entity that is unable to overshadow the attention that the clouds demand, regardless of its occupancy of almost half the canvas. 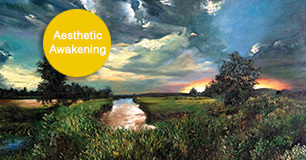 Conceptually, the emotively-alluring aspect of the painting is indeed the pathway that serves as an avenue that promises to lead the viewer to the suggested river, the frolicking clouds and the shimmering sun. The glory and graciousness of the notion of transition is so pertinently and metaphorically represented in Changing Clouds by Shyama. Shyama, who was born in Andhra Pradesh (India), is a devoted artist who is recognised in Hyderabad (India) and Singapore. Painting has always been an undaunted pursuit for her. After getting married, she sailed all over the world with her husband and settled in Singapore fifteen years ago. 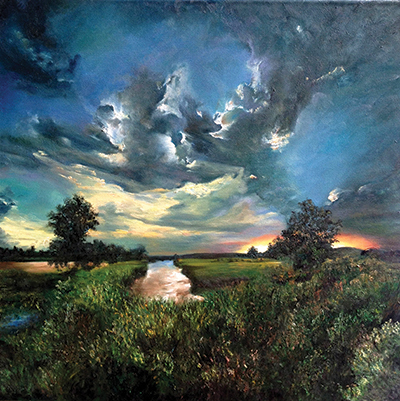 Shyama shares in a matter-of-fact manner, “I was painting actively and diligently while sailing with my husband.” However, it has been five years since she commenced a serious career as an artist. Shyama’s paintings are located in London and Australia and are on regular display in a gallery in Hyderabad (Andhra Pradesh). Shyama was also an artist of the significant exhibition, The Global Icon: Ganesha in Fine Art, which was presented by Gnani Arts in Singapore in May 2014. The sheer power of a metaphor never seizes to amaze me. That which is natural, is transitional. And this is the non-transitional rule of nature. To view artworks by Shyama Nadimpalli, visit www.gnaniarts.com or www.facebook.com/shyama123?fref=ts or call 9003 2851.